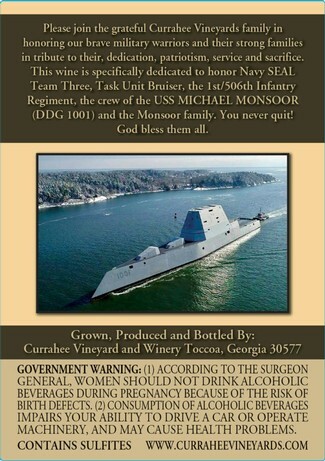 We have produced and bottled a custom sparking wine to commemorate the sacrifice of Michael Monsoor and the commissioning of the USS MICHAEL MONSOOR. This very limited run of sparkling wine will be offered for sale around the start of February, after the commissioning of the ship has taken place in San Diego, CA. Currahee Vineyards will be donating 100 cases of the sparkling wine from which all proceeds will support endeavors like scholarships for Navy personnel as specified by Mrs. Sally Monsoor. 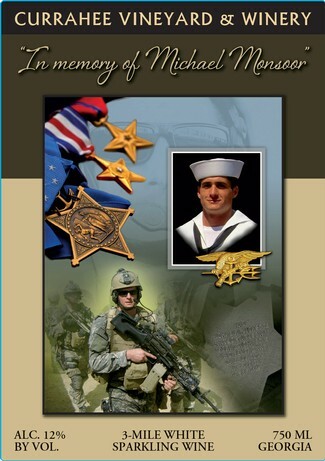 On 29 September 2006, Master at Arms Second Class Michael A. Monsoor earned the Medal of Honor for selfless courage in action while his SEAL Team was attached to and operating in support of Red Currahee in Ramadi, Iraq. As part of a combined American and Iraqi overwatch element, MA2 Monsoor occupied a position protecting the western flank of the main effort to clear a known insurgent stronghold. Although attacked throughout the day, the element remained in place to carry on their mission. An insurgent threw a grenade into the position from an unseen location. Although MA2 Monsoor could have escaped the blast, he observed two of his comrades would not be able to. MA2 Monsoor made the deliberate decision to throw himself onto the grenade and smother the blast, saving the lives of his two teammates. MA2 Monsoor was fatally wounded by the blast. On 24 May 2018, MA2 Monsoor was inducted as an Honorary Member of the Regiment in a ceremony at the Currahee Memorial, Fort Campbell KY. 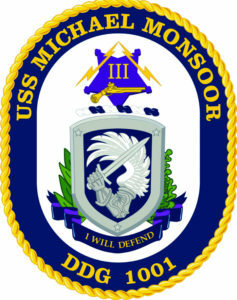 Present for the ceremony were two crew members of the USS Michael Monsoor (DDG-1001) a Zumwalt Class guided missile destroyer named in his honor. The courageous sacrifice of MA2 Monsoor reflects great credit on himself and the US Navy, and the Currahee Nation is proud to consider a warrior of this caliber a member.